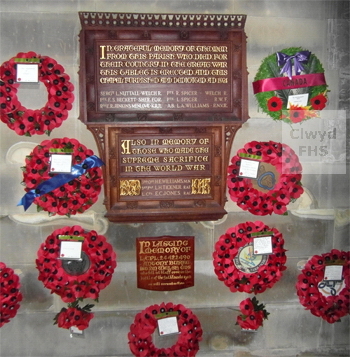 The Bodelwyddan War Memorial takes the form of wooden plaques within the St. Margaret's Parish Church, known as the 'Marble Church'. The World War I plaque was unveiled in 1924 and the World War II plaque in 1948. Bodelwyddan is a village and community in the Vale of Clwyd, Denbighshire. Between 1974 and 1996 it was in the county of Clwyd. (2nd/8th Bn.) 5 Mar 1915 21 Son of George Beckett, of Kinmel Park Gardens, Abergele. St. George's Churchyard, St. George. R/23951 King's Royal Rifle Corps (2nd Bn.). 9th Sep 1916 31 Son of the late Rev, John and Lucy M Jenkins, The Rectory, Hirnant, Llanfyllin, Montgomery (1891 Wales Census): brother of Lucy Rebecca Dormer Jenkins-Menlove and Althea Janetta Lloyd Jenkins-Menlove. Born in Shropshire. Lived in Bodelwyddan. Former Curate of Johnstown. Also named on the Rhosllannerchrugog War Memorial. Thiepval Memorial, Somme, France. 13575 Welsh Regiment (12th Bn.) 25 Jun 1916 34 Born at Maidstone, Kent, England. Son of the late Henry Nuttall & Mary Jane Brereton (formerly Nuttall), of St. Asaph Lodge, Bodelwyddan. St. Margaret's Churchyard, Bodelwyddan. 27222, 11829 Welsh Regiment (8th Bn.) formerly R.W.F. 8 Aug 1915 19 Son of Mrs Sarah Ann Spicer, of 1, River View, Penrhewl, St. Asaph, and the late Frank Spicer. Brother of Robert Aston Spicer (see below). Also named on the St. Asaph War Memorial Helles Memorial, Turkey. 11394 Royal Welsh Fusiliers (1st Bn.) 16 May 1915 22 Son of Mrs Sarah Ann Spicer, of 1, River View, Penrhewl, St. Asaph, and the late Frank Spicer. Brother of John Spicer (see above). Also named on the St Asaph War Memorial. Le Touret Memorial, Pas de Calais, France. (Nelson Battalion) 4 Jan 1918 20 Born at Llandudno. Son of John & Harriet Williams, of 2, Crossfoxes Terrace, Glasgoed, St. Asaph. FlesquiÃ¨res Hill British Cemetery, Nord, France. 950358 Royal Air Force Volunteer Reserve 23 Dec 1941 26 Son of Mr & Mrs L P Tickner, of Worthing, Sussex, England. Durrington Cemetery, Worthing, Sussex, England. 7925028 Royal Tank Regiment, R.A.C. (42nd/23rd Bn., The London Regt.) 28 Jan 1944 Son of Edward & Gwladys O Jones, of Bodelwyddan. Alamein Memorial, Egypt.